We put the set-top boxes up against each other on game selection, remotes, and more. When it comes to gadgets, Apple and Amazon tend to have very different audiences. Consider tablets, for example: Amazon’s entry-level Fire tablet is priced at a stunning $50, while Apple’s cheapest active iPad (2013’s iPad Mini 2) sells for $269. There’s a noticeable gap in quality between the two in many regards, but Amazon’s focus on cheap, usable tech contrasts sharply against Apple’s higher-end polish and performance. The difference is less obvious when it comes to set-top boxes, however. 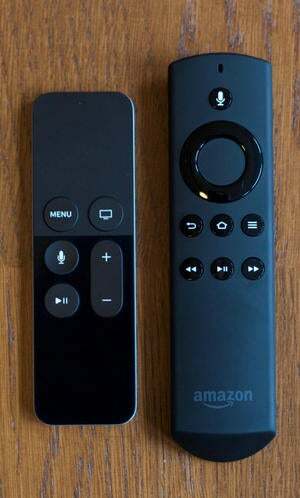 Last fall’s overhauled Apple TV was a big leap for the device, adding apps and games along with the touchpad remote, but Amazon had already mined that territory with the first Fire TV. 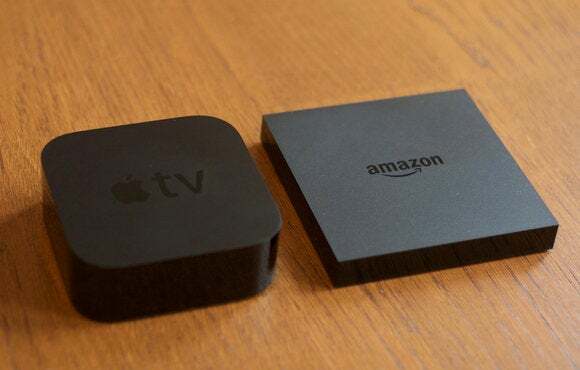 Right after the Apple TV was released, Amazon refreshed the Fire TV with added processing power, 4K resolution support, and other enhancements. And the price difference isn’t quite so dramatic. Game on? Game on! We’ve already put the Apple TV through its gaming paces, sharing our early impressions and highlighting some of the best games and gamepads alike. But after spending the last couple weeks with the latest Fire TV, we think there’s healthy competition here. If you’re an Apple fan, should you really grab an Amazon box? Maybe, and maybe not—here’s our take. As you may know from reading this very publication, the current-gen Apple TV sells for $149 with 32GB storage or $199 with 64GB, and comes with the unit itself, the touchpad-equipped Siri Remote, a power cord, and a Lightning-to-USB charging cable for the remote. It’s powered by the same dual-core, 64-bit A8 chip from the iPhone 6 and iPad mini 4, along with 2GB RAM inside, and runs at a maximum resolution of 1080p on your TV. Meanwhile, the new Fire TV sells for $100 in one configuration with 8GB of internal storage, although you can increase that tally significantly with a microSD card. Otherwise, you get the unit, a non-touch remote control, and the power adapter. It runs off of a MediaTek quad-core processor with 2GB RAM, and can play 4K resolution media (movies and TV shows) on a compatible TV. It’s not as elegant an interface as Apple’s, but then again, it’s not super easy to find the apps and games you want on either box. In both cases, you get a compact, HDMI-connected black box and a slim remote to control it. With the Fire TV, you save $50 off the entry-level Apple TV but get a less-capable remote and much less storage—so much so that you’ll probably want to spring for a microSD card to store more apps and games. Otherwise, both do a lot of the same things: They run Netflix and Hulu, tap into each company’s respective media offerings, and can play their own games and apps. When it comes to gaming on the Apple TV and Fire TV, there are more differences than similarities, surprisingly. Some common games exist between platforms (more on that shortly), but the overall shape of each library reveals stark differences in approach so far. Look at the Apple TV App Store and you’re likely to find a whole lot of iOS ports. There’s some really great stuff in the mix, including Alto’s Adventure, Badland, and Oceanhorn, but many of the releases are already available on your iPhone or iPad—and if you’re reading Macworld, we have a feeling an Apple TV probably isn’t (or won’t be) your first Apple device. 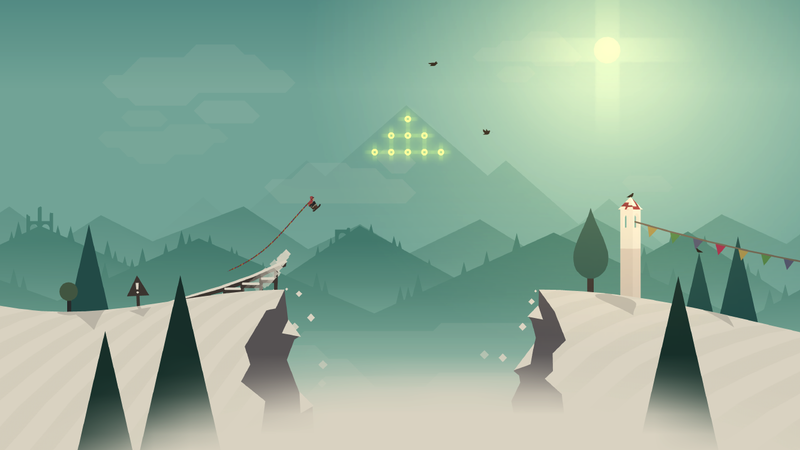 Many Apple TV games are ports of ideal iPhone experiences, like Alto’s Adventure here—luckily, many of them (Alto included) hold up well. There are also games that started on PC and/or consoles and then hit iOS en route to Apple TV, such as Transistor, Geometry Wars 3: Dimensions Evolved, and Octodad: Dadliest Catch, and those are all better enjoyed on the big screen with a gamepad. And there are a handful of noteworthy original Apple TV experiences, as well, such as Galaxy on Fire: Manticore Rising and Beat Sports, along with peripheral-based console game ports like Guitar Hero Live, Disney Infinity 3.0, and Skylanders Supercharged. 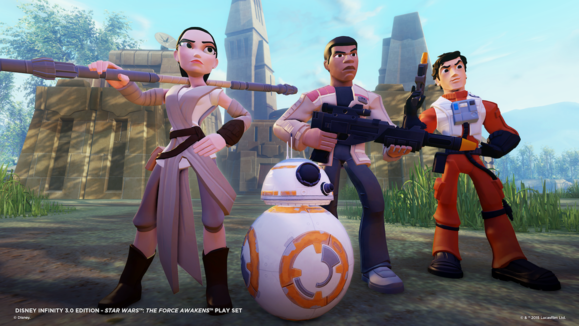 Disney Infinity 3.0, which is played with smart figurines and a Bluetooth-connected base, is one of the rare big, console-style games on Apple TV. And it’s Star Wars! The Fire TV also has mobile-to-TV ports, like Pac-Man 256, Crossy Road, Badland, and Riptide GP2, but more noticeably, it has larger-scale, controller-centric games that the Apple TV doesn’t. Most crucially, it has Minecraft: Pocket Edition, which is delightful with a gamepad, but it also has Telltale Games’ excellent episodic adventures, including The Walking Dead, Tales from the Borderlands, and Minecraft: Story Mode. 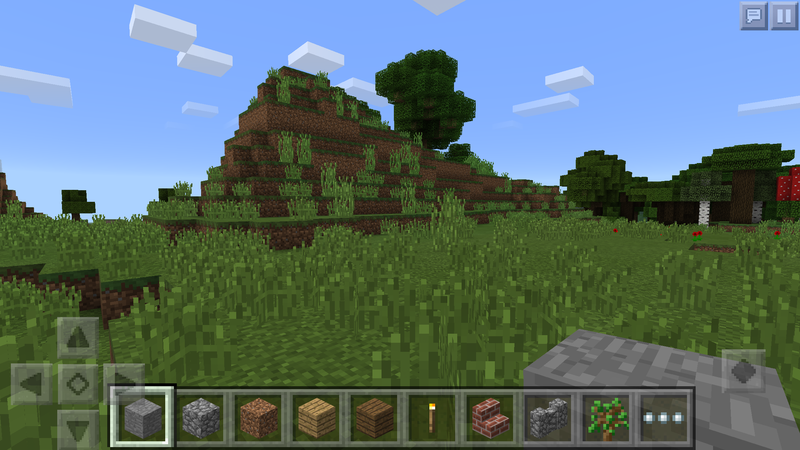 This is Minecraft: Pocket Edition on an iPhone, but imagine it on a big screen without all the extra UI junk—it’s swell. And the list goes on a bit: You can grab huge classic console games like Grand Theft Auto III, Vice City, and San Andreas, as well as Star Wars: Knights of the Old Republic and beloved Final Fantasy and Sonic the Hedgehog games. The Fire TV also has Shovel Knight, a beloved recent console homage to old-school 2D games, along with great Mac games like Luftrausers, Read Only Memories, OlliOlli, and Titan Souls. 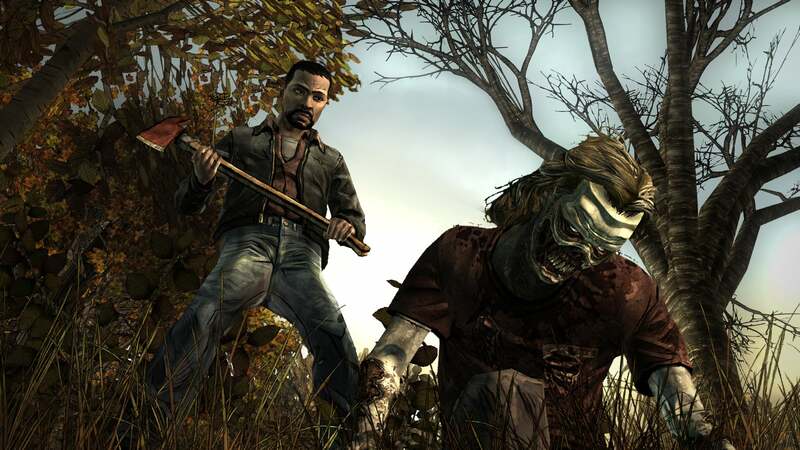 You won’t find Telltale’s episodic adventure games, like The Walking Dead, on Apple TV—not right now, at least. Surely someday, we expect. The more I browsed the listings, the more I found Fire TV gems that aren’t on Apple TV—yet, at least. And because all Apple TV games must offer Siri Remote support, many of those games may not arrive anytime soon. The Fire TV lets creators sell games that require the gamepad, which is another $50, but it opens up the possibilities so much. 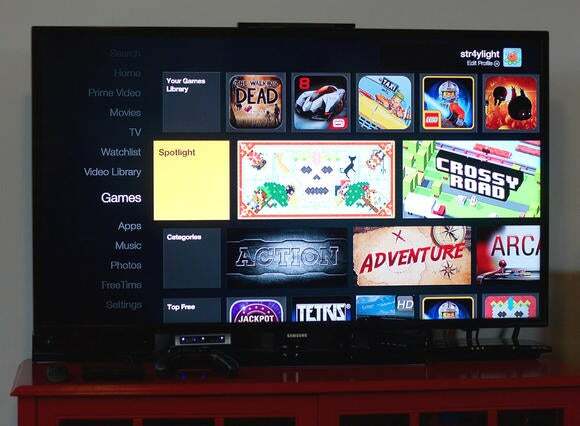 It allows the Fire TV to effectively bridge the gap between what you can play on your phone and what you could play on a game console or computer. When it comes to games that are on both the Apple TV and Fire TV, the differences are small but worth noting. Generally, if there’s a difference, the Fire TV versions run a little more smoothly. That was very evident with Asphalt 8: Airborne, which frustrates on Apple TV with frame rate hitches—but on Fire TV, it’s smooth sailing. In both cases, you’ll have to deal with waiting around and downloading big chunks of extra content before you can play, but the in-game action is slicker on Amazon’s device. Same for Crossy Road, which runs fine on Apple TV but has little split-second hitches here and there—it’s even visible during the developer’s Hipster Whale logo. But on the Fire TV, that’s not an issue. Not every game has noticeable differences: Twin-stick shooter Xenowerk runs about the same on both boxes, as do Pac-Man 256 and Badland. In any case, the performance differences in those earlier games aren’t dramatic, but they are there. The Siri Remote packs a lot of functionality into a tiny space. Amazon’s remote does a lot less. When it comes to the bundled remote control, there’s no doubt about it: Apple’s Siri Remote is much, much better for games. It’s not an ideal device for all types of games, as discussed in our initial Apple TV gaming impressions, but it’s versatile and responsive enough to handle a lot of different inputs between the touchpad, motion controls, and physical buttons. I can’t say nearly as much for the Fire TV remote, which is a more traditional button-based option. It doesn’t have any touch or tilt movement whatsoever, and it’s not configured to be any more useful for games when held sideways like a gamepad. The primary input is a large button surrounded by a directional pad, much like the last-gen Apple TV remote—and that’s fine for something like Crossy Road or Pac-Man 256. Not great, but usable. Switch to Asphalt 8: Airborne, however, and the default control scheme is terrible, trying to convince you that it’s possible to hold the button to accelerate and then also steer with the surrounding directions. Turn on auto-acceleration and it’s playable, but still not very comfortable. Jet ski racer Riptide GP2 is likewise playable with the remote, but there’s no nuance to the streamlined steering, and you’ll bump up against the sides a lot more. Many Fire TV games require the gamepad, while most others are just way, way better with it. In other words, if you’re not willing to pay extra for the gamepad, don’t get a Fire TV to play games. It’s clear that games are a very small perk out of the box, but only a real benefit if you shell out for the controller. At least Amazon sells a Gaming Edition bundle with the box, a gamepad, and two games (Shovel Knight and DuckTales Remastered) for $140—a nice savings. Apple doesn’t make its own official Apple TV gamepad, but there are several licensed MFi (Made for iOS) controllers that work well with it—and the recent SteelSeries Nimbus and Hori Horipad Ultimate also have the Apple TV Home button clearly marked. My pick is the Nimbus ($50), which feels great in the hand, is nicely sturdy and responsive, and has a battery pack that you charge with a Lightning cable. It’s a near-console quality device, although again, you’ve got options (and we’ve covered most of them). 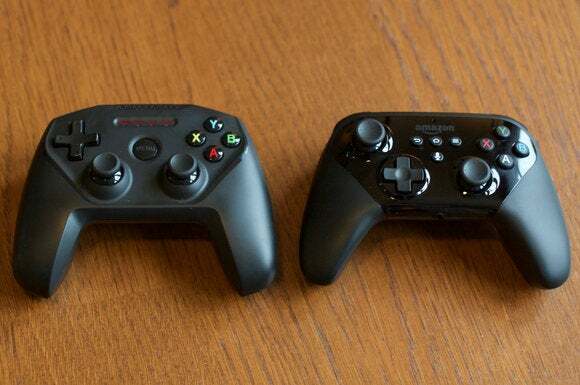 Amazon’s Fire TV Controller is pretty evenly matched with our favorite Apple TV MFi gamepad, the SteelSeries Nimbus. Meanwhile, Amazon has its own Fire TV Game Controller ($50), which was revised for the latest Fire TV model, and it’s also very good. The gamepad is nicely contoured and the buttons are very responsive, plus it has perks like a headphone jack for pumping in audio from the box, as well as a microphone for voice commands. The downside is that it takes AA batteries, but Amazon says that two of them last for upwards of 90 hours. Some other controllers—which you might have laying around—also work with the Fire TV, including Xbox 360 controllers (connected via USB) or an OnLive gamepad—although you might have to fuss with the in-game settings to get them properly configured. Reddit has a whole thread about alternative options and troubleshooting, if you care to try. Really, it’s pretty much a wash between the SteelSeries Nimbus and official Fire TV Controller: Both feel pretty good, work well, and cost the same price, so there’s not much of a sway here in either direction. The Fire TV Controller is a lot more mandatory for its box, given the wealth of controller-only games on Amazon’s storefront, but the Apple TV needs a gamepad for serious gaming too. It’s a worthwhile expense in both cases. If you’re already deep into the Apple device and app ecosystem, the Apple TV is an easy buy: An ever-increasing number of your existing games and apps transfer over with ease and you can tap into Apple’s own media services on top of all that. Furthermore, the Siri Remote has more flexibility as an input device, and the Apple TV interface and storefront are leaps and bounds better than Amazon’s. However, if you’re looking to play larger, more complex, and particularly console-like games on your TV rather than a phone or tablet, I have to give the slight nod to the Fire TV at this time. With the option for gamepad-only games, the Fire TV’s library has big, engrossing games you just can’t find on Apple TV right now, including Minecraft, The Walking Dead, and Game of Thrones, plus classic Final Fantasy and Grand Theft Auto entries. On the other hand, the Apple TV has Transistor, Lumino City, Oceanhorn, Guitar Hero Live, and Disney Infinity 3.0—not to mention a very strong array of smaller but still great experiences. Both platforms have excellent games that aren’t found on the other (as of this writing), but I find both quality and quantity in the Fire TV listings when it comes to larger-scale games. And when there’s a performance difference between the same game on both platforms, it’s in favor of the Fire TV version in my experience. Keep in mind that the gaming value of the Fire TV is almost entirely dependent on buying a gamepad. Without it, the Fire TV has a small collection of decent games, but certainly not enough to buy a set-top box for. And I don’t think that’s going to change—the Fire TV’s main remote isn’t designed for even lightly complex games. But the situation could change for the Apple TV. It has only been on the market a few months now, and the game library will continue expanding and evolving—and I’m sure Telltale’s games will be adapted for the Siri Remote, and perhaps other noteworthy Fire TV games will follow too. At some point, I expect that Apple will cave on the Siri Remote requirement for games, allowing more complex fare like Minecraft to make a smooth transition over. Until then, the Fire TV has extra gaming allure that the Apple TV can’t fully match.